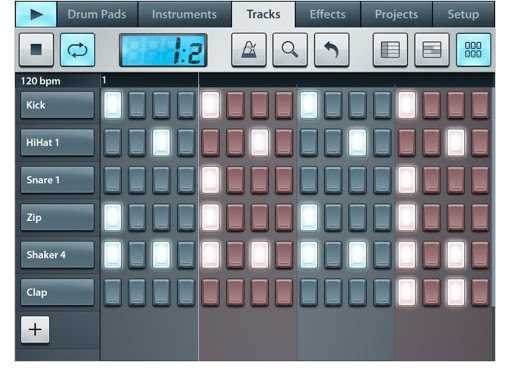 In case you don’t already know, FL Studio Mobile is a 99 track sequencer with playable drum pads, virtual keyboard, with 133 instruments, drum kits, and sliced loop beats. Furthermore FL Studio Mobile HD has a solid set of editing options at track level down to bars and individual notes, and a visualized piano roll editor. The per track basics are all present such as mute, solo, pan, volume, and FX bus. Save, load and export song projects to .wav. Compatible with coreMIDI (in and out). If you find you are stuck or confused there is also a very handy in app user manual. If you have ever used Music Studio, you’ll feel right at home. Much of the FL Studio Mobile HD design is very similar in sight and sound. No complaints here, it does work out very fluidly, and is a pleasure to work with even if you’ve never seen anything like it before. The interface fosters a comfortable environment to compose, and complete full songs on the go (mostly)without clutter or overly complicated menus. The design is honestly as intuitive as Image Line claims. Thankfully V1.1 allows custom instruments made by your own samples from zipped .wav or .instr files. However if you want to quickly paste in a sample directly from another app, well forget it, you can’t. This is a very disappointing limit currently contradicting the word “Mobile” in it’s name. In my opinion, it’s not truly mobile if you must connect to other hardware to get critical parts of the job done. Maybe that’s a feature in development? I sure would hope so, and It will be the most welcome update for users like me who do not want to go back home to simply add a sample of my own. It’s also one of only a few missing components holding FL Studio back from being one of the greats. Though I cannot paste in a file from the pasteboard into FL Studio, it’s still a very good studio app with fantastic audio quality, and design. There is no real synthesis available, but the preset instrument selection is of excellent quality. If you are a MIDI user, then you are covered with MIDI file import/export as well, allowing far more options in the variety of sounds you can use. FL Studios FX are, Limiter, Reverb, Delay, EQ, Amp simulator and filter. They have limited parameters to adjust for advanced fine tuning, but they sound very nice. When the chips are down, and I’m on the road, mobile, or in a canyon, can I complete my songs projects using FL Studio Mobile on my iPad alone? The answer for me is, no. I cannot complete a song project without having to return home to convert and exchange files I created in another app crucial to my song project being built in FL. As an iOS only musician using no external hardware or devices, I’m left wanting more freedom that I’m not certain Image Line intends to offer? An unfortunate similarity with it’s twin cousin Studio app previously mentioned. I really hope it’s only temporary, nothing would please me more. I couldn’t get an answer from Image Line to confirm either way before this posting. 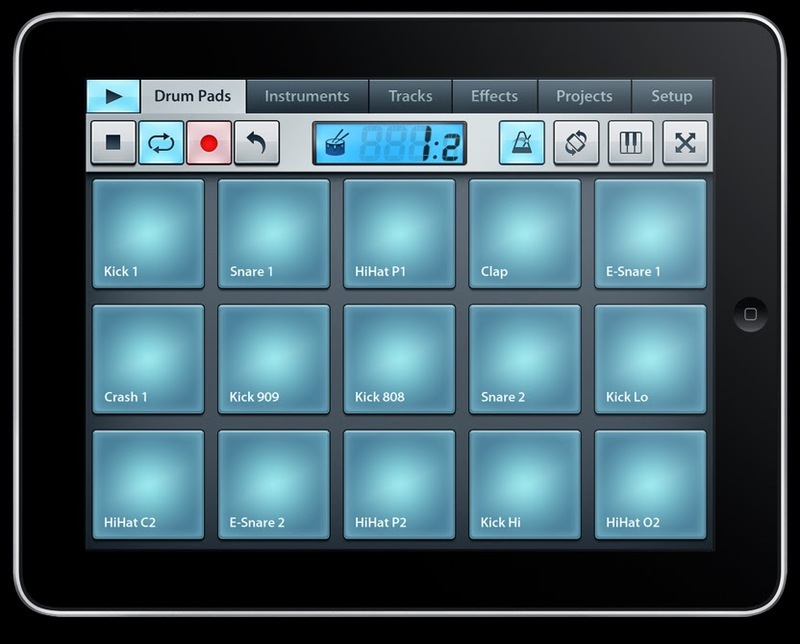 Used with MIDI, and perhaps the desk top version of FL Studio, this is a fine addition that can prove highly useful to users who are less mobile or concerned with complete freedom. In that respect, this is a great companion to any musicians tool box, and does what it’s meant to do, and well. I get the impression that’s really more in line with the “Mobile” versions intended use. It’s a fine sketch pad when used with a full studio set up, but not at all as a truly mobile studio to make music on the go with zero wires. 3.5 Stars. Lacking Freedom, and Synthesis. High quality audio, and great intuitive design. ← A little about me, my music, and my favorite lesser known music apps.